Mobile social payments startup Venmo has some interesting backers and a new iPhone app. The Philadelphia-based company closed $1.2 million in seed funding last May led by RRE Ventures. Other investors include betaworks, Lerer Ventures, Founder Collective, as well as angel investors Dustin Moskovitz, (Facebook co-founder), Dave Morin (founder of Path, senior platform manager at Facebook) and Sam Lessin (Drop.io CEO). Co-founder Andrew Kortina used to work at betaworks, where he was one of the original engineers on URL shortener bit.ly. Earlier today, I met up with Kortina and Venmo’s other co-founder Iqram Magdon-Ismail at a coffee shop in New York City, where they showed me their newest iPhone app (see video above, taken on my iPhone). 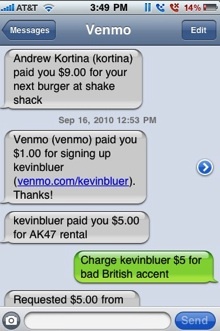 Venmo lets you send payments to your friends through text messages and mobile apps. You connect your Venmo account to a credit card or your bank accounts and then you can make or accept payments. But Venmo puts a social twist on these payments because it allows you to broadcast the fact that you just paid a friend $5 for a beer over Twitter or Facebook. Venmo has been in private beta for a while, and really the only way to try the service was to get invited (try the code techcrunch). But if you download the new iPhone app, you can sign up without an invite. It lets you pay, charge, connect with friends in your phone’s contact book, and see your payment stream. The payment stream is an activity feed of all your payments and your friends’ payments, along with the messages attached to each one. Venmo lets you make messages and payments private, share messages with all of your other Venmo friends, and publish the payment messages to Facebook or Twitter. 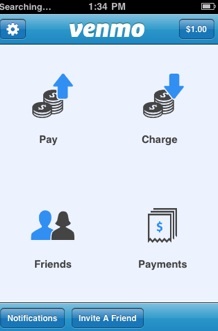 Venmo also has a similar Android app. Once you set up an account, you can essentially follow your friends and watch their public payment activity streams. It is a social way to split up a restaurant tab or to send a friend some money with a suggestion of what to spend it on as a friendly gesture. In the video below, for instance, Iqram charges Andrew for being late to our meeting. There is also a deeper relationship you can form by categorizing someone as a “trusted” contact. Once someone is trusted, payments can start to flow back and forth automatically without prior authorization, as is normally the case. It is like electronic billing for friends. But even with trusted friends you get an immediate notification and can charge the amount back if you don’t like it. I can see this getting messy, especially after a night of drinking or a breakup—choose who you trust on Venmo carefully. Right now, Venmo is starting small and is focussed on just peer-to-peer payments. But if it grows, businesses could start accepting Venmo payments simply by opening an account. Venmo doesn’t get in the middle of the transactions, and so it does not take a cut of each payment like PayPal does. If it can start collecting enough public data about what people are buying, that data could be very valuable to brands and businesses.